Mary-Kate Olsen and Ashley Olsen attend the 2018 CFDA Fashion Awards at Brooklyn Museum on June 4, 2018 in New York City. 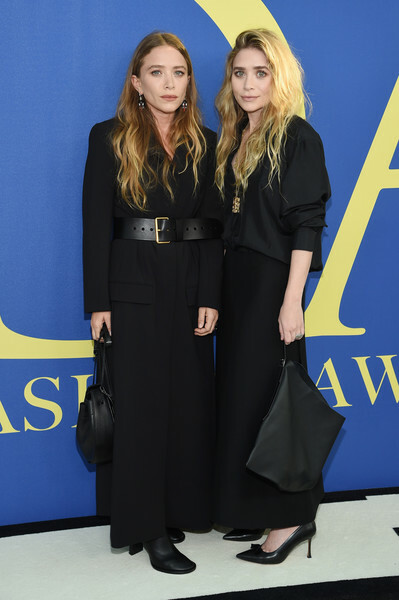 Mary-Kate Olsen bundled up in an ankle-length black tuxedo dress by The Row for the 2018 CFDA Fashion Awards. Ashley Olsen opted for a slouchy black blouse by The Row when she attended the 2018 CFDA Fashion Awards. Ashley Olsen matched her blouse with a black maxi skirt. Ashley Olsen finished off her all-black look with an oversized clutch.